Nikon’s A1R MP is a unique multiphoton imaging system featuring a high resolution galvanometer scanner and a high speed resonant scanner that is capable of frame rates from 30 fps at 512 x 512 pixels to as fast as 420 fps in band scan mode. New 4 channel non-descanned detectors with higher sensitivity, reduced dark current and broad spectral range allow for real time unmixing of closely spaced probes for accurate and high-contrast spectral imaging. This is especially important in multiphoton microscopy because of the overlap of emission spectra of probes and autofluorescence, which is often unavoidable when using a single laser line. Nikon's exclusive resonant scanner is capable of imaging a wide area at a much higher speed than a non-resonant scanner, making it possible for 420-fps imaging— the world's fastest using point scanning technology. 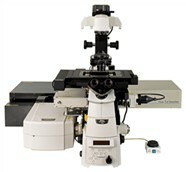 The NDD*1 for multiphoton microscopy makes it possible to image fast and deep through the thickest specimens. Nikon's optical pixel clock system allows more stable and more evenly illuminated imaging— even at high speeds. In addition to spectral detection and unmixing by the 32-channel detector, unmixing by the 4-channel NDD for multiphoton microscopy is also realized. Images captured with a resonant scanner can be unmixed, so clear and high-contrast images of areas deep within a thick specimen can be captured in ultrahigh speed. There are no threads in Nikon A1R MP Reviews at this time.